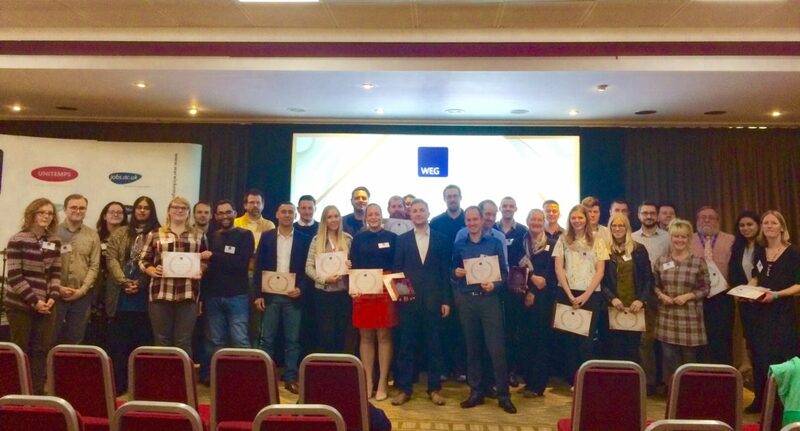 On 15th December 2016, Warwick Employment Group’s associated brands – jobs.ac.uk, college.jobs.ac.uk, Search Higher and Piirus – joined together for the first ever WEG Awards Ceremony. Held at the WEG Staff Conference, the Awards highlighted WEG’s achievements over the last year and gave new insight into overall strategy and ambitions for the future. This year’s launch of Unitemps in Australia won the team the Business Initiative of the Year award as well as the award for Collaborative Team Effort. Franchise Project Assistant Zara Smyth was awarded Support Person Of The Year. Speakers from across the WEG businesses emphasised our achievements this year, including the work of our Franchise Relationship Managers who work to expand the Unitemps network from our existing franchises in the UK and around the world.This year saw the launch of a Unitemps branch at Middlesex University and the first ever International franchise at Griffith University in Australia. The evening was a great success that reinforced WEG’s impact and plans for 2017.